SIIG's M.2 NGFF SSD PCIe Card Adapter adds one M.2 PCIe SSD (M key) to your PCIe equipped desktop computer, dramatically increasing speed and performance. This M.2 NGFF SSD PCIe adapter card accommodates various form factor high performance M.2 PCIe (M key) SSDs via multiple mounting options. It is PCIe 3.0 compliant and installs into PCIe x4 or larger bus slots. With the included spare low-profile bracket, this adapter card can be installed into both standard-height and low-profile system chassis for the utmost versatility in system chassis installation. 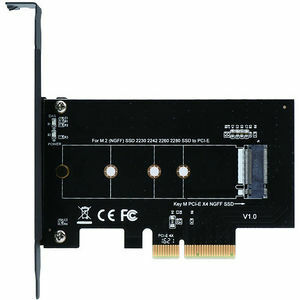 The M.2 NGFF SSD PCIe Card Adapter is the perfect high performance upgrade significantly enhancing system performance by adding M.2 PCIe (M key) SSD capability to your PCIe equipped desktop computer. Note: Systems released prior to 2015 may not support NVMe SSDs. Please check with your system provider for compatible SSD.